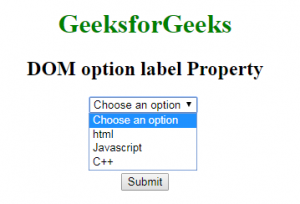 The Option label property in HTML DOM is used to set or return the value of the label attribute in an <option> element. 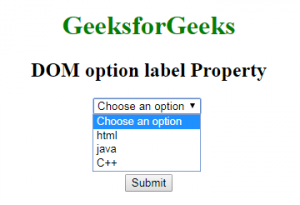 The label attribute is used to specify the label for an option. This attribute contains the text value which represents the shorted label for the option. It is used to return the label property. 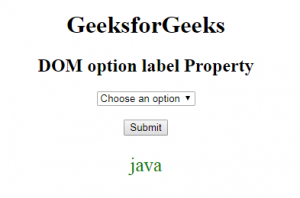 It is used to set the label property. Property Value: This property contains single value text which is used to represents the shorted label for option. Return Value: It returns a string value which represent the shortest label for option element or in a drop-down list. Example 1: This example describes how to set option label property. Example 2: This example describes how to return Option label property.